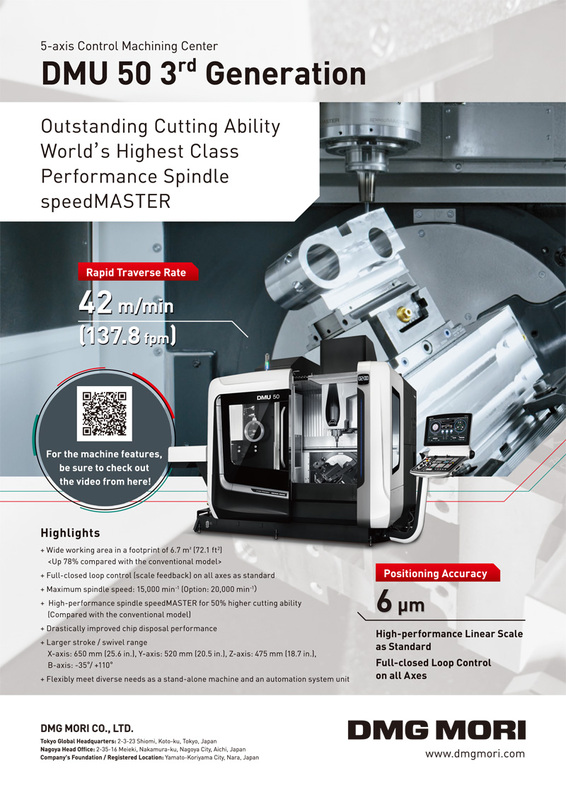 In previous work, we proposed controlling powerassisted carts by using a motor torque limiter that achieves the desired load-reduction ratio even if torque saturates. We assumed, however, that the operator accelerates smoothly up to the target speed, so that when velocity is affected largely by the input force of walking, prediction error becomes large and the target load reduction ratio was not achieved. To solve this problem, we propose an improving the achievement rate of the target load reduction ratio in two steps, first, by predicting the number of steps toward target speed from initial input and, second, by switching the prediction model. We use cart input force and speed to predict operator acceleration patterns. Our proposal predicts operator needs and delivers the desired loadreduction ratio by predicting operation. Results show that the achievement rate of the target load-reduction ratio is improved by using our proposed control. In other words, applying our proposal improves the short available time of power-assisted carts. N. Kobayashi and T. Tanaka, “Control Method for Power Assisted Cart Using Walking Effect Prediction Aimed at Improvement of Load Reduction Ratio,” J. Robot. Mechatron., Vol.26, No.6, pp. 780-789, 2014. N. V. Schwatka, L. M. Butler, and J. R. Rosecrance, “An aging workforce and injury in the construction industry,” Epidemiologic Reviews, Vol.34, pp. 156-167, 2012. 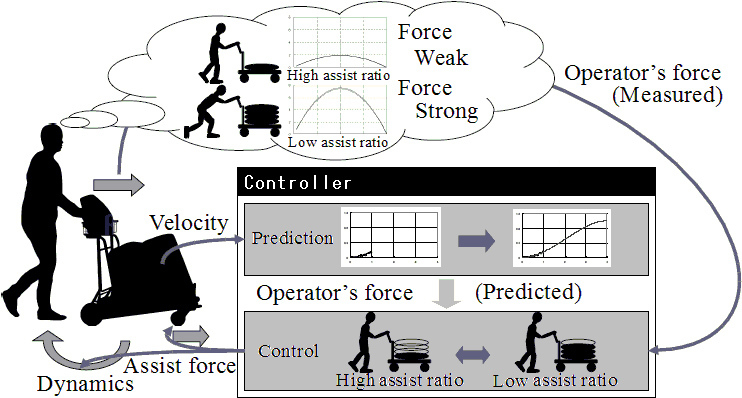 H. Maeda et al., “Development of omni-directional cart with power assist system,” Proc. 18th Annual Conf. of Robotics Society of Japan, Vol.15, pp. 1155-1156, 2000 (in Japanese). K. Terashima, K. Watanabe, Y. Ueno, and Y. Masui, “Auto-tuning Control of Power Assist System Based on the Estimation of Operator’s Skill Level for Forward and Backward Driving of Omnidirectional Wheelchair,” Proc. of Int. Conf. on Intelligent Robots and Systems (IROS2010), pp. 6046-6051, Taipei, Taiwan, Oct. 2010. Y. Nemoto, S. Egawa, and M. Fujie, “Power assist control developed for walking support,” J. of Robotics and Mechatronics, Vol.11, No.6, pp. 473-476, 1999. K. Miyawaki, T. Iwami, G. Obinata, K. Kutsuzawa, and S. Nishimura, “Evaluation of the gait of elderly people using an assisting cart (gait on slope ),” J. of Robotics and Mechatronics, Vol.14, No.6, pp. 538-546, 2002. Y. Ueno, H. Kitagawa, K. Kakihara, and K. Terashima, “Design and Control for Collision Avoidance of Power-assisted Omnidirectional Mobile Wheelchair System,” Proc. of IEEE/SICE Int. Symposium on System Integration (SII2011), pp. 902-907, Kyoto, Japan, Dec. 2011. N. Kobayashi, T. Tanaka, and S Kaneko, “Power-Assisted cart Control Method with Motor Torque Limiter based on Prediction of Torque Saturation,” J. of Energy & Power Engineering, Vol.6, Issue 8, pp. 1349-1357, Aug 2012. A. Kaisumi, Y. Hirata, and K. Kosuge, “Investigation of User Load and Evaluation of Power Assistive Control on Cycling Wheelchair,” J. of Robotics and Mechatronics, Vol.25, No.6, pp. 959-965, 2013. A. Nakamura, Y. Fujimoto, O. Nitta, and T. Yamaguchi, “Intelligent Powered Wheelchair Assistance in Daily Use,” J. of Advanced Computational Intelligence and Intelligent Informatics, Vol.14, No.3, pp. 281-287, 2010. K. Miyawaki, T. Iwami, G. Obinata et. al., “Evaluation and development of assistive cart for matching to user walking,” J. of Robotics and Mechatronics, Vol.19, No.6, pp. 637-645, 2007. M. Saida, Y. Hirata, and K. Kosuge, “Motion Control of Castertype Passive Mobile Robot with Servo Brakes,” Advanced Robotics, Vol.26, Issue 11-12, 2012. S.-R. Ke, L. U. Thuc Hoang, Y.-J. Lee, J.-N. Hwang, J.-H. Yoo, and K.-H. Choi, “A Review on Video-Based Human Activity Recognition,” Computers, Vol.2, No.2, pp. 88-131, 2013. T. Mori and K. Tsujioka, “Human-Like Daily Action Recognition Model,” J. of Robotics and Mechatronics, Vol.17, No.6, pp. 672-680, 2005. T. Choudhury et al., “The Mobile Sensing Platform: An Embedded System for Activity Recognition,” IEEE Pervasive Comp., Vol.7, No.2, pp. 32-41, 2008. K. Kiguchi, M. Liyanage, and Y. Kose, “Perception Assist with an Active Stereo Camera for an Upper-Limb Power-Assist Exoskeleton,” Int. J. of Robotics and Mechatronics, Vol.21, No.5, pp. 614-620, 2009. M. Kienle, D. Dambock, and J. Kelsh, “Towards an H-Mode for highly automated vehicles:Driving with side sticks,” AutomotiveUI 2009, pp. 19-23, 2009. M. Rahman, R. Ikeura, and K. Mizutani, “Investigation of the Impedance Characteristic of Human Arm for Development of Robots to Cooperate with Humans,” JSME Int. J., Series C, Vol.45, No.2, pp. 510-518, 2002. C. Dias, M. Sarvi, N. Shiwakoti, and O. Ejtemai, “Experimental Study on Pedestrian Walking Characteristics through Angled Corridors,” 36th Australasian Transport Research Forum (ATRF), pp. 1-11, Brisbane, Australia, 2013. T. Frash and N. Hogan, “The Coordination of Arm Movements: An Experimentally Confirmed Mathematical Model,” The J. of Neuroscience, Vol.5, No.7, pp. 1688-1703, 1985. Y. Maeda, T. Hara, and T. Arai, “Human-Robot Cooperative Manipulation with Motion Estimation,” Proc. IEEE/RSJ Int. Conf. Intelligent Robots and Systems (IROS), Vol.4, pp. 2240-2245, 2001. B. Zhang, S. Jiang, K. Yan et al., “Human Walking Analysis , Evaluation and Classification Based on Motion Capture System,” In Health Management – Different Approaches and Solutions, InTech, pp. 361-398, 2011. T. Ito, “Walking Motion Analysis Using Small Acceleration Sensors,” Int. J. of Simulation, Vol.10, No.3, pp. 65-71, 2009. M. Altini, M. van Dort, R. Vullers, C. van Hoof, and O. Amft, “Self-Calibration ofWalking Speed Estimations Using Smartphone Sensors,” PerCom Workshops 2014, pp. 10-18, Budapest, Hungary, 2014. P. Lukowicz, H. Junker, and G. Troster, “Automatic calibration of body worn acceleration sensors,” Proc. of the Second Int. Pervasive Computing Conf., pp. 176-181, Vienna, Austria, 2004. D. Satkunskiene, V. Grigas, V. Eidukynas, and A. Domeika, “Acceleration based evaluation of the human walking and running parameters,” J. of Vibroengineering, Vol.11, Issue 3, pp. 506-510, 2009.